Vova App offer – Get Earphone, watches, USB Cables, Bluetooth headset at just Rs.2 Only. yes, you heard right, You will get a Freebie absolutely free via this app.So hurry up and avail this awesome offer to grab a free item. Note:- All Orders Delivered by VOVA, Check Proof !! They have added UPI/Netbanking for Indians. Don’t use any Multiple Trick, Else your order will be cancelled, Even don’t use same debit card on 2 accounts !! 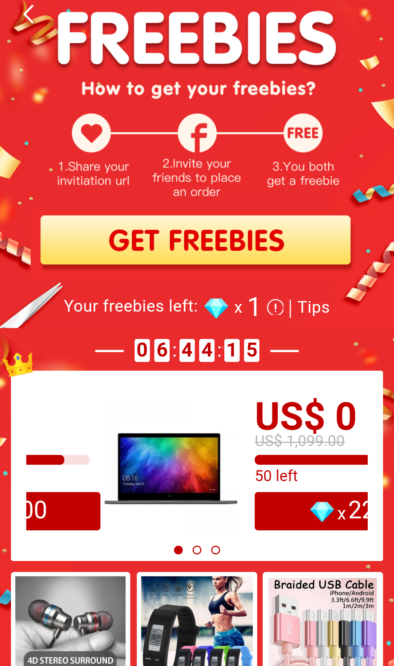 Note:- If you are Old user and Your Freebie Diamond is Expired, You will get it by 25th Jan, said Vova Product Manager. 4. Now click on 0£ (freebies) banner and You will see 20 Diamond in your account. 5. Now on Freebies Page, Scroll Down and You will See many Products at 1 Diamond (Like Earphone, watches, USB Cables, Bluetooth headset, Mouse et and More, Add any Product of your Choice. 6. Now Add Your Address and you have to Pay just $0.02 = 1.5 INR via PayPal (Tmw, My airtel, Pockets, Kotak 811, DBS card also works). 7. Your Product will delivered successfully within 10-15 days.